Usually news from Juicy Stakes is about online poker tournaments but these days they're eager to show off the new blackjack software in their casino. So eager that they'll give you twenty free hands this month! Until May 26th, you can get a free $1 bet on each of the twenty hands and you get to keep what you win. The wagering requirement on your winnings is only 5X which seems pretty good to me. They had me at "free" though lol. We can choose play classic Blackjack, Face Up 21, Double Draw or Perfect Pair. One is fine for me, but you can play up to three hands at a time if you want. Get a $1 free bet and keep what you win. 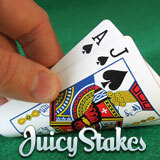 Juicy Stakes’ casino has lots of online casino games including Roulette, Baccarat and slots but the Blackjack tables have been particularly popular since the Cake casino software was upgraded. It features a unique (optional) player coaching system and an excellent hand history tool. Recently, a Blackjack Leaderboard contest got lots of players all over the world to check out Juicy Stakes new blackjack tables.